March of 2011 changed everything at VCU. After a 3-5 February under Shaka Smart, Ram fans had a ton of questions about their then-head coach and the direction of the program. It’s amazing how quickly those questions vanished and what has happened since that magical March. The following is just a snapshot/reminder of the past five seasons since the Rams’ historical run to Houston. VCU’s on-court success following the Rams’ magical 2011 Final 4 run has been a thing a beauty for the most part. The Rams lost almost all the key pieces from their 2011 team yet managed to follow that run with five consecutive NCAA tournament apperances including one the following year after losing the majority of their production from that legendary Rams team. Despite a rise in weight class after leaving the CAA for the more competitive Atlantic 10, VCU has remained atop their conference, appearing in the Atlantic 10 tournament final in all four of their seasons since joining the conference, an almost unthinkable accomplishment for such a competitive league, winning their first A-10 tournament with a four-game run in 2015 then following that up with a regular season co-championship this past season. The Rams kenpom ranking (my prefered source for accurate national ranking) actually peeked before VCU’s heralded 2014 class hit the floor for the first time (in the 2014-15 season), taking a dip last year then another slight dip this past season after Will Wade and Co. was forced to plug the holes vacated by the graduations of Treveon Graham and Briante Weber, as well as the departure of former top-50 recruit, Terry Larrier. Despite that ranking Wade and his staff managed to crack the code of his new team, taking his first Rams group to an A-10 tournament final after wrapping up the Rams’ first ever regular season title (co-champs with Dayton and St. Bonaventure). VCU was picked to finish fifth in the preseason with that team. Maybe I’m a tough grader, but I dip the Rams’ on-court success below an A because while VCU has been to five consecutive NCAA tournament’s since their Final 4 run, winning games in three of those tournaments (but against Wichita State, Akron and Oregon State…not exactly murderers row), the black and gold have yet to reach the second weekend of the NCAA tournament since 2011. The Rams have been darn close in two of those seasons (2012, 2016), but close only counts in horseshoes and hand grenades. A second Sweet 16 appearance is no doubt the goal for every VCU team from here on out. Will Wade landed his highest rated recruit as a head coach with the signing of 2016 ESPN top-60 recruit, De’Riante Jenkins. The funny thing about VCU’s post-Final 4 recruiting is so far the Rams best new faces after that run were arguably the two that committed before VCU actually made the Final 4: Treveon Graham and Briante Weber. The 2012 class boasted VCU’s first top-100 recruits (excluding incoming transfers like Jamie Skeen) in Melvin Johnson and Jordan Burgess. Johnson found his way to VCU after decommitting from Miami. 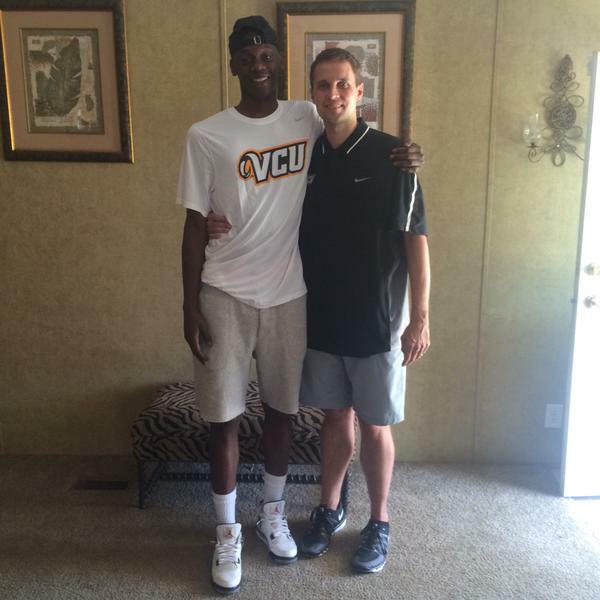 Burgess was likely headed to VCU regardless of the Rams’ Final 4 run thanks to his family ties to the Rams. Mo Alie-Cox and Justin Tuoyo proved to be the sleepers of the class, Alie-Cox finding massive success at VCU while Tuoyo followed Will Wade to UTC (before Wade returned to VCU), earning Defensive Player of the Year honors in the SoCon. Shaka Smart and Co. didn’t hit on any top-100s with their 2013 class but landed what I think is an eventual VCU legend in JeQuan Lewis — who had an incredibly underrated 2015-16 season and is poised for a huge senior campaign. Half of Smart’s 2013 class transferred due to lack of minutes/opportunity but have found success in less competitive conferences. VCU’s 2014 class was one of the best in the country on paper that year, consisting of three top-100s. Only half of that class remains at VCU after the transfers of Terry Larrier and most recently Mike Gilmore. Justin Tillman however has shown flashes of a serious dominating talent (led the A-10 with an in-conference 72.7% fg%…whoa) while Jonathan Williams seemed to hit his stride late last season under new head coach (scoring a team-high 17 in a crucial late-season road win at GW). Gilmore struggled to get minutes under both Smart and Wade despite his lofty top-80 ESPN ranking and has opted to continue his career elsewhere. Will Wade was forced to put together a last-minute 2015 class but did secure two fairly highly ranked decommits in Samir Doughty and Jonathan Nwankwo. Only Doughty will continue at VCU after Nwankwo’s transfer, joining Scissum who left to pursue a career at JMU (Wade also grabbed successful transfers Korey Billbury and Ahmed Hamdy that offseason). Wade however seems to have had more success with his 2016 class, landing top-60 commit De’Riante Jenkins, VCU’s highest rated recruit since 2014’s Terry Larrier and the third-highest rated recruit in VCU’s history (Kendrick Warren joins that group as a 1990 McDonald’s All-American). He’s also added high-scoring Maine transfer, Issac Vann and freshman guard Malik Crowfield and Marquell Fraser. Wade and Co. have multiple high-level offers out including a slew of top-100s and five-star recruits. Whether they can land them is another story, but it appears VCU’s post-Final 4 recruiting is back on the rise after an impressive showing in Wade’s first season as head coach at VCU. Both Smart and Wade have benefited from VCU’s newfound popularity. Smart signed a total of seven top-100s to VCU in his four seasons following the Final 4 (two of which decommited and one of which transferred following Smart’s move to Texas). Will Wade had to slap together his 2015 class after being hired last April, but given time to recruit to VCU has shown he can lure some elite talent. Conference Affiliation – The Rams left the typically one-bid Colonial Athletic Association for the multi-bid Atlantic 10 and have secured an at-large bid in three of their four seasons in the conference. VCU received just one at-large bid as a CAA member, doing so in 2011 (what proved to be a pretty important bid for the Rams). The CAA was later decimated by the departures of fellow top teams, Old Dominion (CUSA) and George Mason (A-10). Siegel Center upgrades – The Tommy J. West luxury suites was VCU’s first post-Final 4 upgrade, doing so the summer following the Rams’ run that season. Gone went the big gray southside wall of the Stu. In its place went a fancy new luxury suite including office upgrades for the VCU Athletics staffers. The Stu would later add two corner corporate suites as well. VCU Basketball Development Center – That’s the fancy way to say “practice facility”. Will Wade’s new gem of a gym was completed just months after the former Rams assistant returned to downtown Richmond and gives VCU one of the best practice facilities in the country for both men’s and women’s hoops and with that a major recruiting tool. The BDC cost roughly $25 million, an upgrade from a previously planned smaller versions initially set to be built in the parking lot just West of the Siegel Center. More National TV appearances – The Rams became a household name in 2011 and were able to parlay that newly improved Q rating into more national TV appearances the following years. VCU’s 2015-16 seasons wrapped up their fifth consecutive season with at least 20 nationally televised game. There was a time not long ago when many of us can remember having to listen to most VCU road games (R.I.P. Terry Sisisky, we love ya and we miss ya!). This increase in national exposure is not only great for Ram fans, but a recruiting boost as well. Upgraded Siegel Center, brand new practice facility, jump in conference, you name it, the VCU Athletics staff, led by both Norwood Teague and Ed McLaughlin, weren’t going to make the same mistake George Mason made in not capitalizing on their Final 4 run. VCU Athletics has upgraded everything and continues to do so, making VCU basketball much more of a national player than they were prior to 2011. 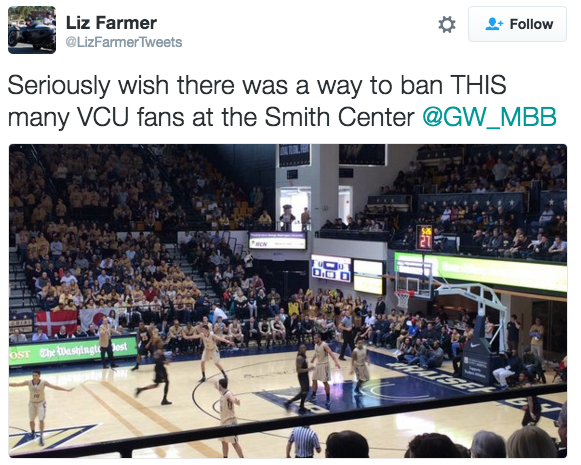 A GW fans tweets about VCU’s recent takeover of the Colonials’ Smith Center in a key A-10 conference game. VCU’s fan support has been unbelievable since the Rams Final 4 run. The obvious is the season ticket waiting list and the five-season consecutive sellout streak, but how about the bars around Richmond filling up for away games and tournament action? The idea of multiple bars packed with black in gold in 2010 for VCU games seemed unfathomable. Now, on the right night with the right game, you’re lucky to get a seat in a place like Baja Bean Co. or Home Team Grill, located just blocks from each other while basically every bar in the city has the VCU game on when the Rams are playing. It’s impressive and reminds me of the excitement I saw UNC Tarheel fans display years ago in Chapel Hill’s Top of the Hill restaurant/brewery. We’ve come a long way as witnessed in both sold out home games and VCU dominated road (GW this year) and neutral court games (every A-10 game played in Brooklyn). You failed to mention the center hung video/scoreboard as an enhancement to the Stu. Second most important upgrade in my opinion behind the TW Club. However, fwiw I would also subtract points in this category for absolutely lousy concessions in the Stu and the lack of, or unwillingness to, add at least some additional seating capacity in the building. Just my opinion.